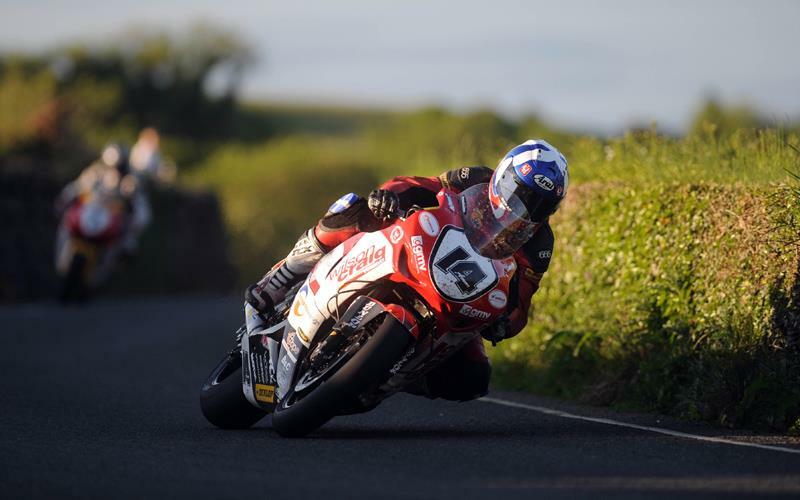 Scottish rider Keith Amor is one of the many pre-event favourites for success at this year’s Isle of Man TT Races and we caught up with the Wilson Craig Honda rider today to find out how practice has gone so far. Two nights in, how are preparations coming along? Not too bad. It took me a while to get my head back into TT mode but I’ve been happy to get 4 laps in on both Saturday and Monday evening. The big bike’s a little bit ‘flighty’ at the moment so we’re going to revert back to the settings we had for the second Superbike race at the NW200 and try that tonight. It’s just causing me a few stability issues, particularly from Ginger Hall to Ramsey where it’s very hectic to say the least. The 600 feels really strong but, overall, I think I’ve been running all 3 bikes a wee bit stiff so we’ll stiffen them all up for tonight. Apart from that the bikes are all good. It’s your third year now at the TT, where do you feel you can improve? The main thing is to piece it all together and make it one complete lap rather than still doing it in sections. John (McGuinness) followed me through Kirk Michael and said I was really good but as soon as I got to Bishopscourt and Alpine I was at sixes and sevens. I’m struggling with the glare of the sun as well as it’s hard to know what’s what. I’m just that little bit unsure about where everything is when visibility isn’t perfect and am erring on the side of caution. I’m poor at Crosby jump as well. It’s ok on the 600 but I don’t like it at all on the big bike as it’s getting into a few wobbles and that’s not much fun at 170mph! You can’t roll off either as you’d lose too much time so I need to get my confidence up to keep it pinned through there. Over the Mountain, I feel I’m as strong as anyone. I can see where I’m going and it’s a bit like a big short circuit so feel confident to push really hard. How do you rate the competition this year? I imagine it’s as tough as it’s ever been, certainly in the last 8-10 years. The entry list reads like a who’s who. Having said that, John is definitely the man to beat. I followed him a bit on both Saturday and Monday and he’s silky smooth. He’s nowhere near any of the kerbs and has such a brilliant flow and rhythm. He doesn’t pull big chunks on you but he just keeps edging that bit further ahead. If I could get to be a bit like him I’d be happy! He’s already looking stronger than what he did last year so unless he has mechanical trouble, he’ll be very hard to beat. And how do you rate your own chances? I want to be on the podium in every race I’m entered for. I’m not sure if that’s going to be possible but that has to be the aim. It’s my third year so if I can get enough laps in during practice I won’t be too far away. The bikes and team are good enough and I’m confident that everything has come together at the right time. Every one is saying the 600 is my best class, particularly after my result last year and it’s the only biek that doesn’t have to be set up perfectly around here. I’m learning all the time and we’re definitely coming!